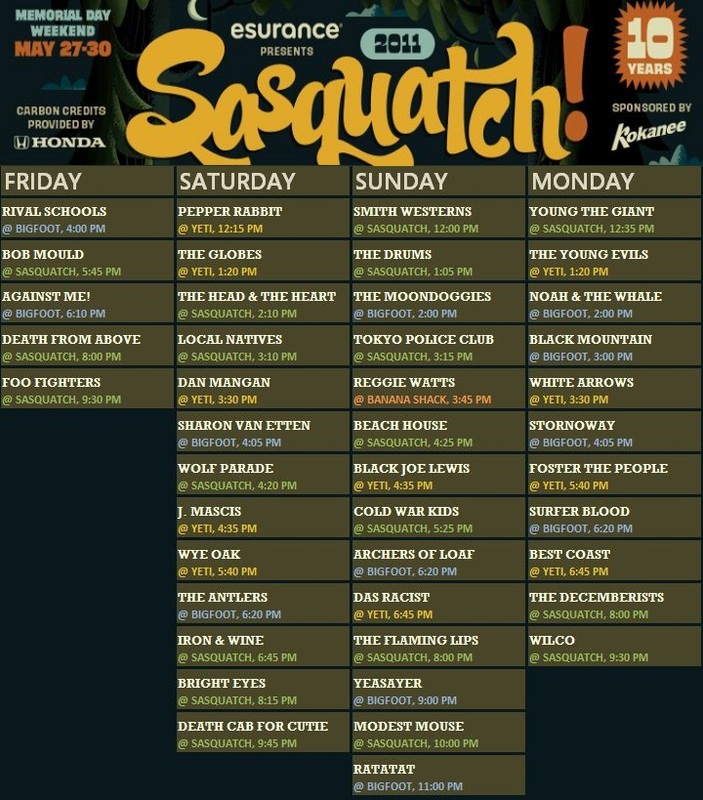 Presenting… Our Official Sasquatch 2011 Schedule! As we write and/or tell those within earshot every day, the city we call home is exceptionally rich with great live music options. During the summer, this trite statement hardly begins to scratch the surface. In addition to the usual tough choices we’re faced with at our favorite venues, festivities and summer-only venues tip the situation to be one of an embarrassment of riches. While we’ll talk more about some of our favorite events like KEXP’s concerts at the mural, block parties and other street festivals throughout the better months, now we turn our attention to the massive musicfest east of the Cascades: Sasquatch! Giving Bumbershoot, the bookend festival at the other end of the summer, a run for its money since it’s inception, Sasquatch surpasses Bumbershoot in both natural beauty and buzz bands. If all goes as planned, this year will be no exception. We’ll be rolling out recommendations over the next few days, so keep your eyes here as we approach the best Gorge weekend of the year. With past festivals featuring hail storms and ad hoc dance parties, we’re sure we’ll come home with lots of fun stories. That said, here’s our full schedule for the coming weekend. We’ll highlight our favorites through the end of the week, but if you’ll be at the festival and want to say hello to the SEA live MUSIC team, here’s where we’ll be. It’s going to be a busy weekend!